Can you relate? Be honest…It’s okay – we have ALL been there. Getting publicity for yourself or your business isn’t an easy job, and watching other people inside – or outside – of your niche succeed when your moment in the spotlight hasn’t happened yet, well it can be understandably frustrating. What will set you apart from other entrepreneurs, however, is how you choose to react to their press success. React (or overreact) badly, feeling down about yourself and your business, and run the risk of analysis paralysis about your own business and PR outreach, that will get you nowhere fast. Perhaps you feel “Well, they already landed that magazine/blog/TV show, why should I even try? Sometimes this jealousy or defeat that others’ publicity success brings on can even have you boarding the first boat to Self Doubtville, heading towards a downward spiral where you end up “circling the drain” mentally. NOT a good place to be. React like a Press for Success pro and see their publicity success as a positive sign (YES, I will teach you to feel this way), and then respond to it strategically. No overreacting, friends, only strategic responses that don’t raise your blood pressure while lowering your productivity. Yes, it’s tempting to have a personal pity party when others – especially those in your niche – are landing publicity but guess what? It doesn’t have to feel like that!When people in similar industries as you – or people who share a similar lifestyle that’s being featured (entrepreneur, work from home mom, etc) – get publicity, see it as a neon sign flashing over the media outlet that signals WE COVER STORIES LIKE YOURS HERE! WE ARE INTERESTED IN YOUR BEAT! See what I mean? The fact that they covered someone with a similar expertise or product doesn’t mean that your chance of coverage is gone, but instead that they have an interest in what you have to offer. This is not a goodbye to press, it’s a hello! It’s like someone is marking a path to possible press opportunities for you. In fact, when I’m planning my own PR outreach I always give the website press pages of people in my industry a glance so I can be sure I’m not overlooking or missing any possible media “homes” for my own story. 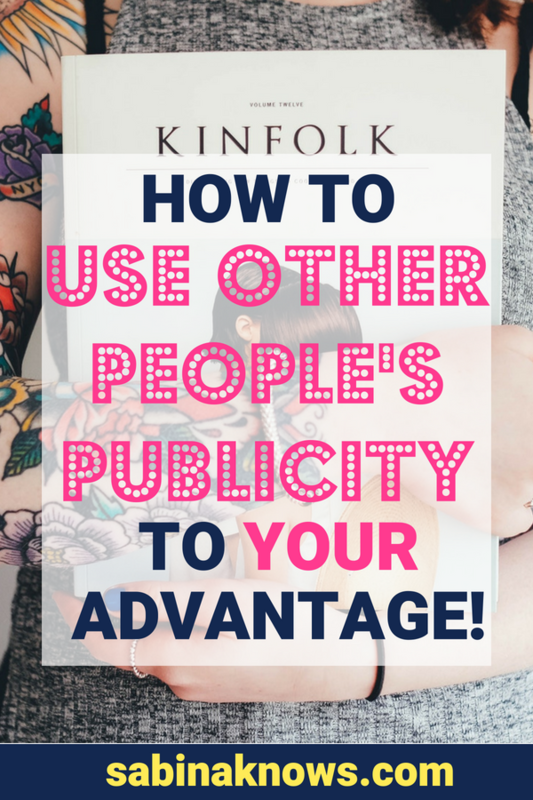 Record ALL the details that you can from this other person’s publicity. Key information you want to take with you includes what the media outlet was, who the editor/blogger/content creator was, and a few notes on this story or a link to it. I also love to “Pin” the publicity inspiration I see when others get press and put it on Pinterest on a secret board I call “Press Targets”. This is a helpful habit to get into if you feel too busy to record possible opportunities as you see them. When I do this, I know I won’t even lose track of potential media homes for my story and business, and I can access them, research them, and record them at anytime, simply by popping into this Pinterest board. Once you’ve discovered a member of the press or a media outlet that is covering businesses like yours (or even your competition), you’re going to make a strategic assumption that they may be interested in getting to know your business, expertise, and product as well! NOW you’re going to be happy that you saw that other person’s publicity because you’re going to mention it in the email pitch you send to the press target that covered them! Seem simple? Because it is! It’s PR, not ER, baby! This simple update to your normal pitch is solid because it shows your media target that you follow their work (because you mention a recent story they did) and that you’re aware of their beat, and that you’re part of it! KABLAM! PR power moves! Remember: You don’t want to show that you’re the same thing as the story they just did, just the same beat (their beat). In your pitch make sure you differentiate and show your value to their readers, viewers, or listeners! Be sure you aren’t making easily fix-able PR mistakes: Dive into my FREE 7 Day PR Shift that will take you from PR Hot Mess to Publicity Express! Grab it right here! Be sure you’re in my (free) Facebook community, packed with hundreds of entrepreneurs, experts, and makers who are regularly getting publicity for their brands, and sharing tips, strategies, and support along the way. Download this Freebie: Stop wondering if the ideas you are emailing the press are what they’re looking for! Instead, download my FREE E-Book packed with 35+ Story Angles that the media will find irresistible. It’s the perfect must-have for building relationships with the press and buzz for your business! Download it for free, here! How do you react constructively when others get publicity – or any business success – instead of turning on them or yourself? Share it with us in the comments below!